ZAGG's folio-style keyboard case was popular with iPad 2 users, and fortunately the existing design accommodates the third-generation iPad, too. While many slim-fit cases don't work with the slightly thicker build of the latest iPad, the ZAGGfolio ($99 as of May 11, 2012) snugly slips around the new tablet. The outside of the case is hard plastic, wrapped in various colors and materials. The carbon-fiber version I tested feels stylish and durable. The folio-style cover holds the iPad on one side and the keyboard on the other; both the iPad and the keyboard slide in from an opening along the center of the folio. It’s a good thing that the keyboard is removable: Since the Micro-USB port for charging the keyboard is covered by the case, you’ll have to take the keyboard out to charge it. ZAGG promises several months between charges, so you won’t have to remove the keyboard often. Sliding the new iPad into the case is a tight fit. The iPad side bends back in the middle, allowing the bottom of the iPad to tilt forward into the slot behind the keyboard. I found the slot to be at a good angle for desktop usage--important, considering that it's the only angle you get. Behind the iPad slot are the on/off switch, the connect button, and two LEDs that indicate status and charging. That means all of these controls are behind the iPad when it's open, which can make the initial setup a little annoying. You get only one angle; fortunately it's a good one. A clip on the outside of the folio holds the iPad closed against the keyboard while leaving enough of a gap to keep the keys off the screen. The clip is stiff, however, and makes opening the folio difficult. Annoyances aside, this is one of the most comfortable iPad keyboards I have used. Despite the size restriction of having to fit the keys within the dimensions of the iPad, the spacing feels good. Key travel is decent for how slim the keyboard is, and the feedback is reassuring. The keyboard is solid, with minimal flex in the deck. I could type on this keyboard all day long--and I did, with no issues. Thanks to the sturdiness of the slot behind the keyboard, the iPad stays propped up securely for typing on your lap, just as it does when the whole combo is sitting on a table or desk. Of the six iPad keyboard cases I tested, this one felt the most comfortable in my lap. The top-row function keys include iPad-specific shortcuts for such actions as returning home, initiating search, toggling to the on-screen keyboard, and performing cut/copy/paste; also present are playback controls, volume controls, and a rotation lock button. 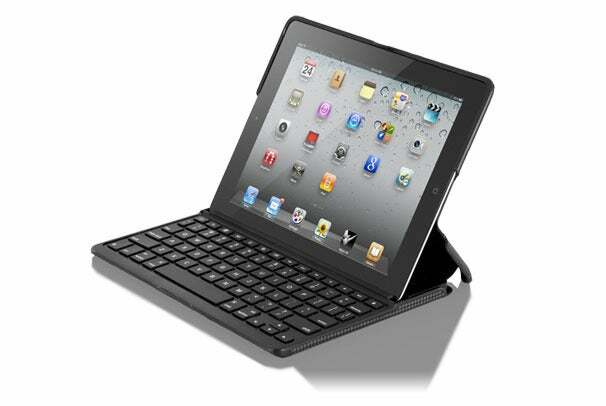 If you want to do a lot of typing on your iPad, the ZAGGfolio keyboard is one of the most comfortable models available. The whole setup remains slim enough to slip in your bag without much added weight or bulk. And you can still slide the iPad out if you want to use it without the keyboard. ZAGG has managed to fit nice-feeling keys into a slim folio case with Smart Cover-style magnets, all for an affordable price.